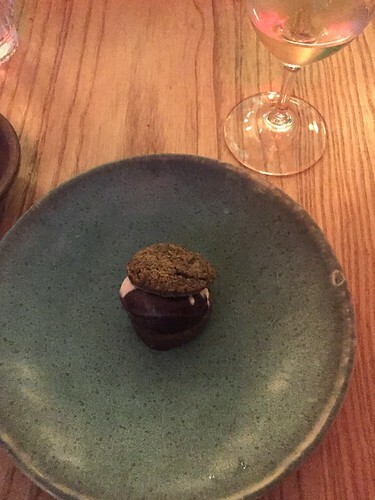 Had a really lovely and vegetable-heavy dinner at the intimate, 18-seat Semilla in Brooklyn (yes, I traveled all the way out to BK) a few months back that surprised and lived up to all of the hype it’s been receiving since it opened. 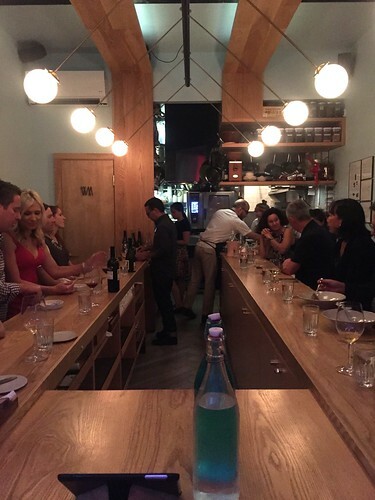 10 courses with beverage pairings in an intimate setting with friendly, open staff and good Cahill company. 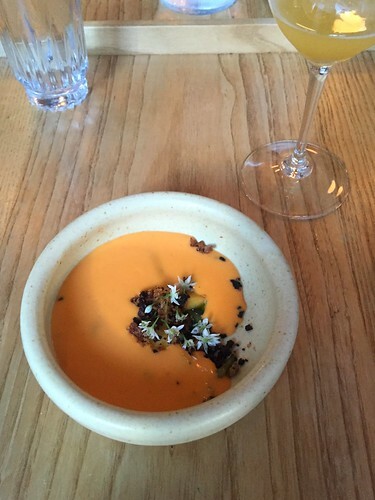 Tomato gazpacho with peaches, rat tail radishes and black olives paired with Cremant d’Alsace, Dirler-Cade, 2012 from Alsace, France. I’d just been telling Chris and Wes that I don’t really like fruit in savory dishes but this cold soup proved me wrong. So flavorful and clean. I also don’t like olives that much and was crazy about them in this dish. Tomato salad with cucumbers and scallops and stuffed tomato with ricotta and basil with Dupont cidre, bouche brut from Normandy, France. 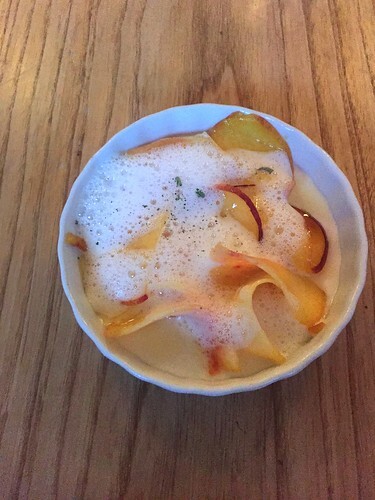 I didn’t get a photo of the cute stuffed tomato but it was pure summer in a bowl and one of the most memorable bites of the night. Sweet corn chawanmushi with matsutake mushrooms with Grimm, Rainbow Dome, from New York. Perfect balance of sweet and richness, with lots of umami and unctuousness. 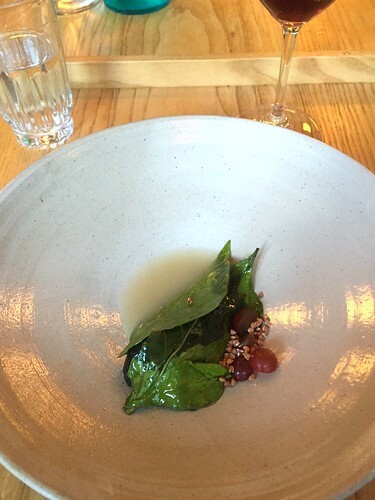 Roasted eggplant with pepper leaves and grapes with Gamay, Les Chamins de Traverse, Bachelard, 2013, from Beaujolais, France. The most distinct characteristic of this course was the heavy smoke. 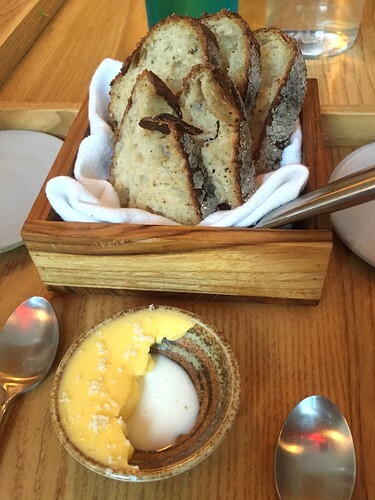 Bread course of Anson Mill’s grits sourdough with Cowbella butter and buttermilk…which I could not stop eating. Buttermilk with butter is a genius idea. 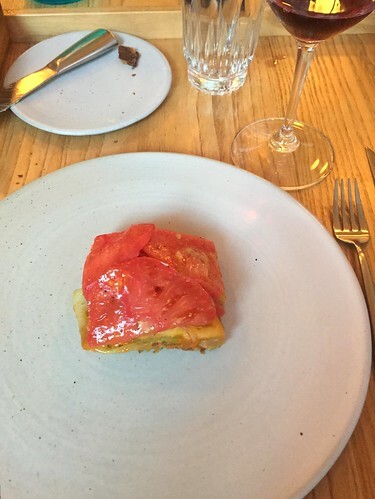 Tomato tart with Feints Cuvee Zero, Ruth Lewandowski, 2013, California/Utah. Also deceivingly simple but everyone really loved this dish. I have no idea what was in the crust but it reminded me of a Cheez-it (my favorite childhood snack) and was kind of mind-boggling to have it paired with floral shiso. 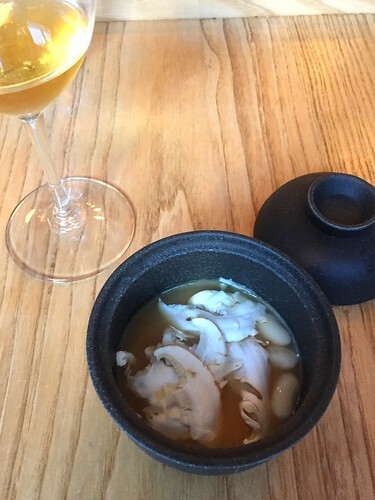 Lobster mushrooms with corn and mole with Chenin Blanc, Els Bassots, Escoda Sanahuja, 2013, Conca de Barbera, Spain. Another reminder of childhood – peaches, saffron & bitter almond. Growing up in a Chinese family, the only dessert we’d ever serve (other than straight up fruit) was almond jello that came in a packet served with fruit cocktail. 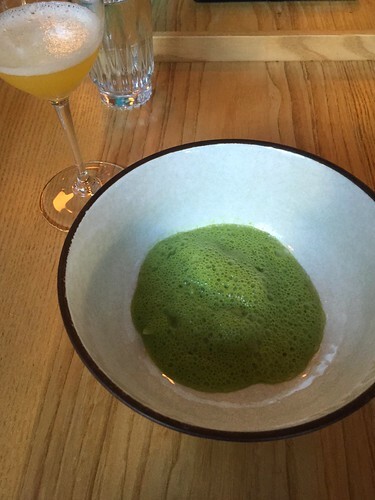 Think of this as a highly refined, delicious version. Tarragon profiterole with wild blueberry and buttermilk with Chinato Americano, Vergano, from Piemonte, Italy. To be honest, I wasn’t crazy about the tarragon/anise-y element but it was still a nice end to a meal that surpassed expectations and showed how creative cooking with vegetables can be (we really did not miss the meat at all). Would definitely visit again, especially since chefs Jose Ramirez-Ruiz and Pamela Yung change the menu according to the seasons. Looks delicious! And I’d never thought of butter AND buttermilk together… but now that I see it, it looks brilliant! 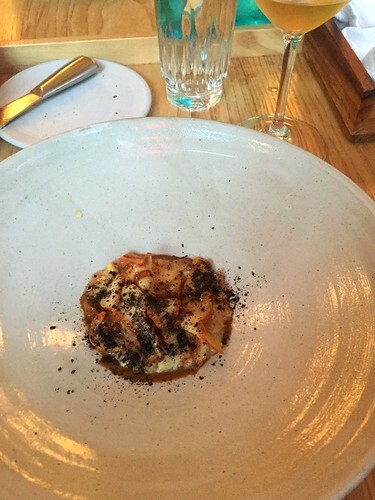 You are currently reading The tasting menu at Semilla at Notes on Food.